Born: November 5, 1985 Position: Pitcher (~2019) / Batter (2019~) Bats: Right Throws: right (~1997) / left (2000~) Fastest Throw: 104 m/h (167 km/h) Teams: Student Mifune Dolphins (1995, 4th grade) Hakata Little (1996~1997, 5th~6th grade) Mifune East Junior High (2000, 9th grade) Kaido High Scool JV team (2001~2002, 10th~11th grade) Seishuu High School (2003, 12th grade) Professional Anaheim Salmons (2004, for one game during MLB Spring Training) Cougars (2004, for one game during Spring Training) Memphis Bats (2004 regular season) Indiana Hornets (2004 post-season Arizona Autumn League, 2005 MLB Spring Training, 2005-2019 regular season) All Japan (2005 Baseball World Cup, 2013 Baseball World Cup won) Yokohama Blue Oceans (as batter since 2019 to ??) 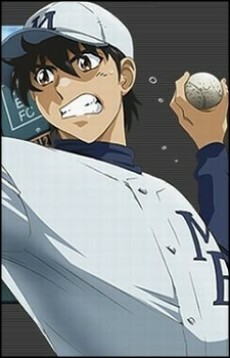 The story's main character, Goro Honda is a young talented baseball player. His love of the game stems from his father who played for the Yokohama Marine Stars. Wanting nothing more than to follow in his father's footsteps, he strives to become a professional ball player. Thriving on the challenge of the mound, he puts everything into the competition. He makes friends easily, as people are drawn to his personality and his excitement of the game. After Momoko and Hideki married his name was changed to Goro Shigeno. He initially pitched right handed, but blew out his shoulder in senior little league. In junior high school and high school, he pitches left, but continues to bat right. While he never made it to Koshien, his excellent match against the Kaido High School earned him the attention of many professional baseball team's scouts. However, he went to America and joined a Triple A team, the Memphis Bats. During the Baseball World Cup, he replaced the injured pitcher Noro, and played as an excellent closer. He used to only pitch gyroballs ("rising fastball"), though beginning with the Baseball World Cup, he has successfully added gyrofork ("forkball") to his repertoire. He and Kaoru Shimizu start dating in the fifth season. They marry at the end of the series and have two children in the Major Message OVA. A daughter named Izumi who is born on the day Goro wins the World Series and a son named Daigo.